Just when I thought I knew it all when it comes to the kitchen – my mom went to culinary school after all and has taught me well – I learned something new, and pretty handy at that! Today we went to Foodie Cádiz, a kitchen located on la Calle San Germán, to learn how to cook tapas. There were three chefs helping us this evening, and one of them asked us what the first thing a chef does, which, of course, is to wash their hands. After doing so we each received a black apron and gathered around the kitchen island for the group photo. Then we proceeded to dive into the world of Spanish cuisine. 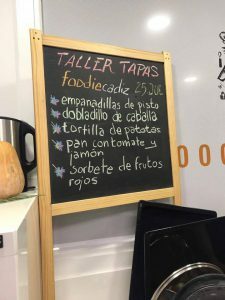 We stood in a circle around the large island and went through the Spanish names for each of the ingredients of each of the tapas on the menu, which consisted of empanadillas de pista, dobladillo de caballa, tortilla de patatas, pan con tomate y jamón, and sorbete de frutos rojos. There were also, of course, ingredients to make sangria. The chefs began explaining how to cut each vegetable, handing the task off to a willing participant after each explanation, until we were all peeling, cutting, or whisking away. There were eggs to crack and whisk, potatoes to peel and cut, tomatoes, zucchini, and eggplant, oh my! And my handy new trick? Do you know how tomato skins are so hard to cut, and the inside so soft, that when you do finally break through you make a big mess? Well, if you take a chef’s knife and puncture the tomato skin with the notch in the knife where the blade meets the handle? Easy as pie. It cuts smooth as butter after that. Soon, while veggies were being sautéed by some of us, others began to prep the dishes. First came the dobladillos de caballa, which consisted of mackerel, arugula, cherry-sized green-and-red tomatoes, and a mustard mayonnaise sauce, on a small flour tortilla. An assembly line was formed, one person dabbing the mayonnaise onto the tortilla, passing it on to the person who had the mackerel, who then passed it on to the person with the arugula, and finally to the person with the halved tomatoes, who plated the tapas. The second dish to be plated was the pan con tomate y jamón, or bread with tomato and ham. One of us would cut up a baguette (of which there were three in total), then two of us would each take one piece and brushing it with a tomato purée and then plating two pieces per dish. Next another would pour some olive oil over the tomato purée, and finally cured ham was folded on top of the bread (and cheese placed on the bread instead of ham for the vegetarian in our group). When the veggies had finished sautéing, four of us took to the task of making the empanadillas de pista, a kind of dumpling-esque tapa with the veggie filling. Pre-made circles of thin dough (like gyoza wrappers but with wheat) were filled with veggies and then folded over into semi-circles. The two sides of the dough were then pressed together gently with a fork, and the empanadillas were put onto a pan and coated in egg. Next we set up our dining space. We tool out three tables and set out paper mats, napkins, and silverware, and then brought chairs over. Finally, it was time to eat. We each got up and grabbed a plate of dobladillo de caballa and a plate of pan con tomate y jamón, as well as a glass of sangria. One of the chefs asked how many of us would like to try the gazpacho she had made for us, and many of us did. Now, when you saw that tortilla de patatas was on the menu, did you think we were going to be eating flour or corn tortilla wrappers filled with potatoes? That’s probably what I would have thought before I came here, to Cádiz. Fun fact: a tortilla española is actually eggs whisked and cooked over a stovetop. Thus, our tortilla de patatas was simply whisked eggs poured over cut up potatoes and baked in the oven. Simple, but tasty. Then the empanadillas came out of the oven and we each were served two to try. After mostly everyone had finished their food, out came the sorbete de frutos rojos, or the “red-fruit sorbet,” topped with a cookie. Finally the night came to an end. We all said a big thank you to our hosts, and took our leave. What a night…¡Que delicioso! 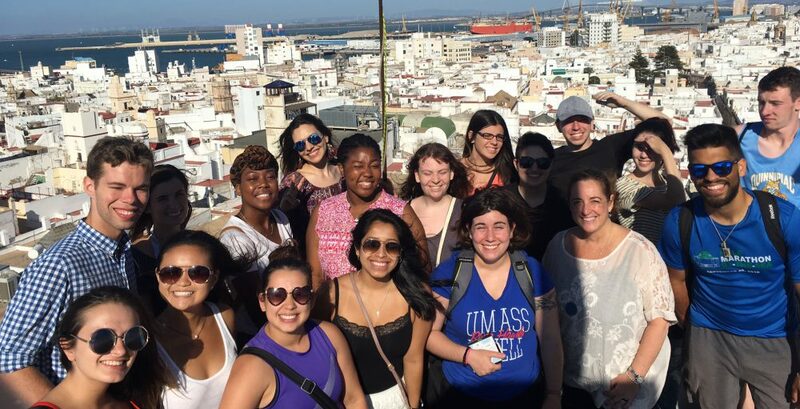 This entry was posted in Uncategorized by emma_wood@student.uml.edu. Bookmark the permalink.